The BoJ and the JPY. Yesterday USDJPY broke out of an upper channel resistance at 102.50, which for us confirms that a bottom is now in place. Beyond current momentum, the major catalysts for JPY weakness are found within the newly designed BoJ monetary policy. Here the BoJ no longer aims to lower bond yields across the curve, but instead to manage a generally positively sloped curve aiming to keep 10-year yields near zero even in the case of inflation overshooting the 2% target. Rightly, investors cited the dilemma that you can either control quantity or price, but you cannot control both. Hence, investors were convinced the BoJ's 0% yield target would lead to an implicit tapering, specifically since the country has a current account surplus, generating an excess of savings which push down yields. Investors assumed that the BoJ's monetary base would grow less than suggested by the JPY80trn QE promise provided earlier and that this implicit decline in the monetary base growth rate would lead to a lower USDJPY. A race of USDJPY downside projections peaked with ex MOF's Sakakibara calling USDJPY to reach 90. We believe this assessment is wrong for several reasons. Our reasons for further JPY weakness. Firstly, the assessment above does not take into account the potential for an increase in monetary velocity from the changing environment for commercial banks. In particular the potential for bank profitability to rise and hence increase their risk taking capacity when yield curves stay positively sloped and while the back end trades near predictable levels. Soon we will dive deeper into this theme. Secondly, the steeper international yield curve environment will push the JGB curve up too. With JGB long end yields rising, the BoJ can execute bigger QE purchase operations which will support its monetary base growth. 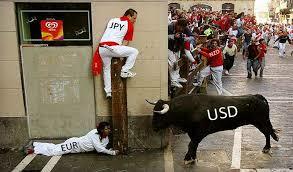 JPY weakness will be the result.